We are a family owned retail shop located in historic, downtown Monticello, Illinois. I received my first piece of Polish pottery while living in Germany, and have been using it every day since. It is by far the most superior stoneware I have ever used. Fantastic to bake in, easy to clean up, and so many patterns and shapes to choose from, it is fun to create your own unique collection! Polish stoneware is truly beautiful and functional for all occasions. Each piece is still painted by hand so no two pieces are exactly alike. I love sharing my passion for Polish pottery with people who are already avid collectors or are looking for their very first piece. We enjoy helping our customers find just the right piece for themselves or for a special gift. We invite you to visit our shop anytime to add to, or start your Polish pottery collection! We are easy to find right off Interstate 72 between Decatur and Champaign. Since opening in May of 2006, our business has grown and expanded to our current location. We are now a destination for Polish pottery, and are able to offer you the best selection in Illinois! 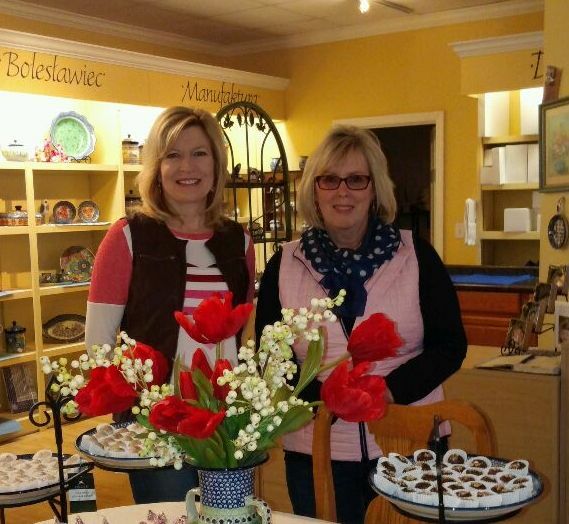 Out of the Blue Pottery is excited to now be serving our customers in two locations! You can still find us just off the square in Monticello, Illinois serving the local community and visitors to our city. This year we are proud to have opened our newest location in Carmel, Indiana. Opened in September, our new location in the Carment City Center, is ready to serve our neighbors in Indiana. Come by and see our new store!